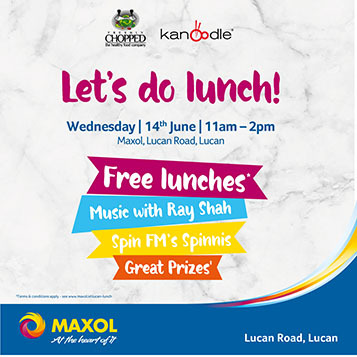 There will be free Lunches on the day by Chopped & Kanoodle from 11am-1pm and half price from 1pm to 5pm, choose from Teriyaki Chicken, Lebanese Falafel or the Dubliner Caesar by Chopped or try one of Kanoodles authentic Asian one pot dishes, Red Curry Chicken, The Kanoodle or Chicken fried rice with Chilli, spoiled for choice! There will also be music with Ray Shah and lots of great prizes to be won, chat with the Spinnis from Spin FM on the day to find out how. We look forward to seeing you there! Click here for Maxol competition terms and conditions.